Containing contributions from leading academic and industrial researchers, this book provides a much needed update of foam science research. The first section of the book presents an accessible summary of the theory and fundamentals of foams. This includes chapters on morphology, drainage, Ostwald ripening, coalescence, rheology, and pneumatic foams. The second section demonstrates how this theory is used in a wide range of industrial applications, including foam fractionation, froth flotation and foam mitigation. It includes chapters on suprafroths, flotation of oil sands, foams in enhancing petroleum recovery, Gas-liquid Mass Transfer in foam, foams in glass manufacturing, fire-fighting foam technology and consumer product foams. Dr Paul Stevenson is Senior Lecturer at the Department of Chemical and Materials Engineering, University of Auckland, New Zealand. Paul has a First Class Chemical Engineering degree, and a PhD from the University of Cambridge. 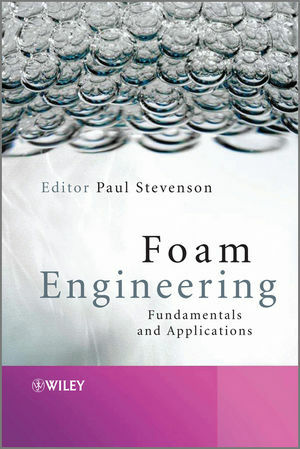 Paul has worked in the field of foam and its industrial applications for eight years, and has published extensively on the fundamentals of foam science and the use of foams in flotation and fractionation.